Try this dal with Methi Makai ki Roti, to make a satisfying low fat meal. Cooking Time : 20 to 25 mins. 1. Clean, wash and soak the whole urad and rajma overnight. Drain and keep aside. 2. Combine the dals, and salt with 2 cups of water and pressure cook till the dals are overcooked. Whisk well till the dal is almost mashed. 3. Add the milk and 1 cup of water and simmer for 10 minutes while stirring occasionally. 4. Heat the oil in a non-stick pan and add the cumin seeds. When the seeds crackle, add the onions and ginger-garlic paste and sauté till the onions turn golden brown. 5. Add the chilli powder, turmeric powder, coriander powder and tomato pulp with ¼ cup of water and sauté for 5 to 7 minutes. 6. Add this to the dal mixture and simmer for 10 to 12 minutes till the dal is thick and creamy. 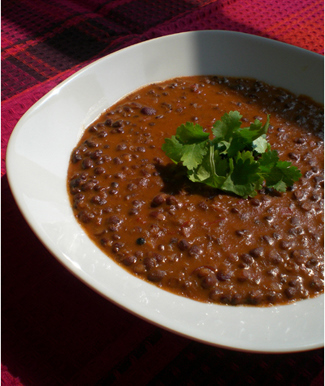 I love Dal Makhani! That's a great recipe, everybody should definitely try it.